Tell me how hard is it to resist that muffin sitting on the desk? Before you know it you’re gorging on a pack of 12 muffins in one sitting. Well maybe that’s just me but we’re really here about weight tracking apps. 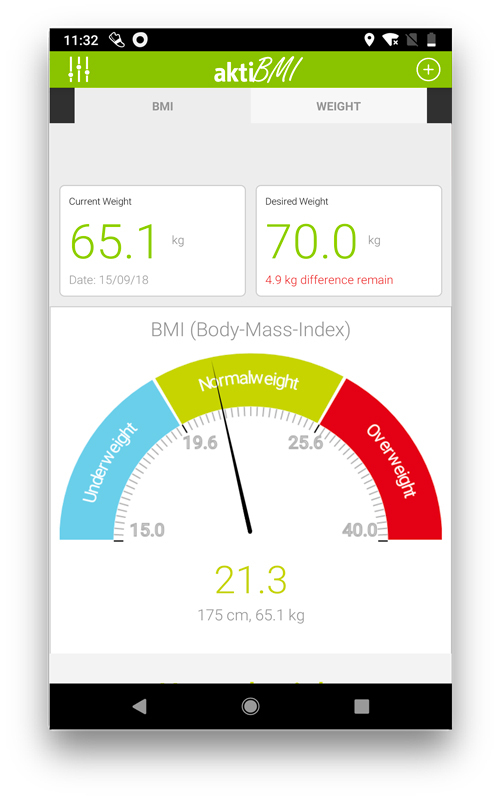 Now you might wonder which app would suit you the best, what features does it have and everything related to a weight tracking app? That’s what we’re here for and I have made a list of best weight tracking apps for Android and iOS. Let’s check it out. aktiBMI helps you to track your weight and BMI using manual entries. 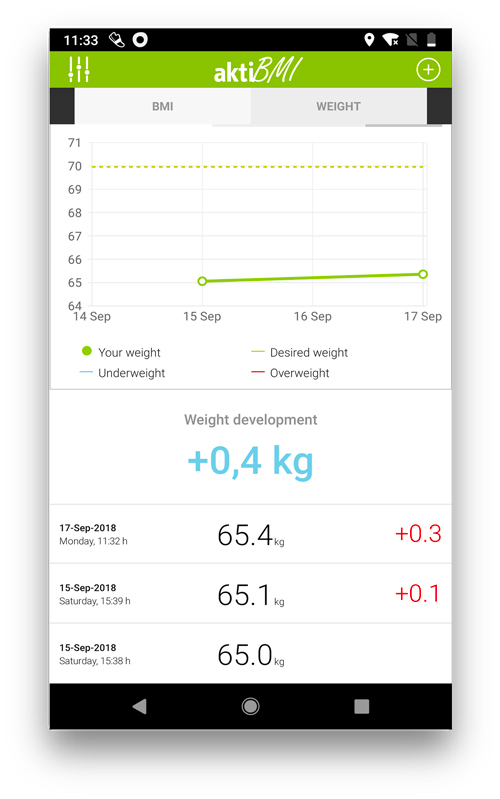 You can log your weight with this app and it shows the entries on a graph which gives you a decent idea of your weight loss progress. Once you open the app, you need to provide your height, weight, DOB and your gender, and then it creates a profile for you and sets a weight goal. The inbuilt BMI calculator gives you an approximate idea of your body health based on the BMI index. During your weight loss journey, it gives you a meter reading which reads your current BMI value displaying your health status. Adding a new entry is easy, you can just press the top right + button to add an entry with date and time. Although a majority of the apps are designed for people looking to shed pounds. You can use it to gain weight and add mass. 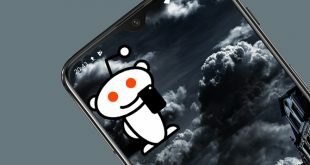 The database is maintained on the app, however, you can export the file to the phone’s storage and even import data from the phone to the app. You can then share the database to your cloud storage. The app has a pro version which lets you log your body data like muscle percentage, fat percentage, water percentage as well as the size of belly, waist, and hip. You can also export charts to your cloud with it. This is the most comprehensive app in the list. It gives you a very detailed analysis of your weight and diet. You set up a basic profile in which you choose the units of weight, height, energy. To keep things private it has a PIN lock which you can activate in the advanced settings. It allows integration with a few smart scales, like Garmin, Wahoo, Fitbit Aria, WiT and the health app. It allows you to automatically log the weight whenever you wish. The main details page shows the statistics in a comprehensive way. You can see your current weight, target, and start point weight. It tracks the progress and the time elapsed since the goal started. If you don’t have a smart scale you can always enter the data manually. The history page shows you the log and the gained or lost weight below the original weight. You can delete any redundant entries which may affect the graph. It supports multiple languages and you can export your data to the cloud. 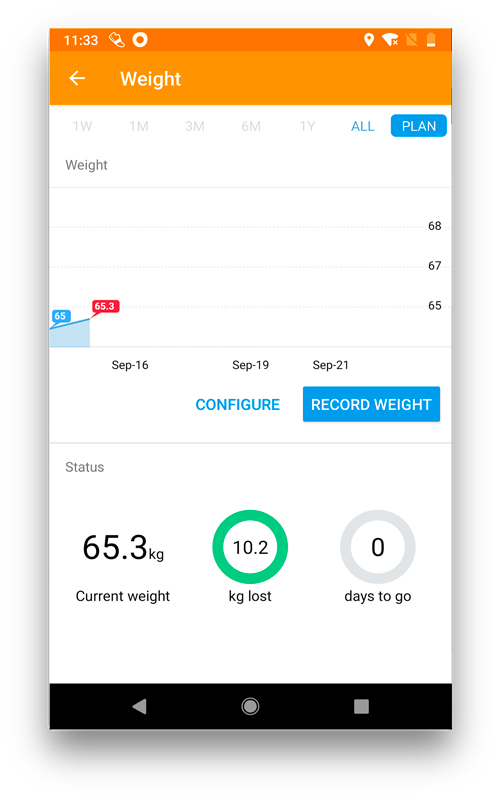 Loseit is another well-known app that helps you track weight. Rather than just being a weight tracker app it also tracks your calorie consumption and expenditure with its inbuilt calorie counter. You get a nutrient tracker which tracks how much protein, carbs, and fats you consume in a day and creates a weekly graph that shows your progress. 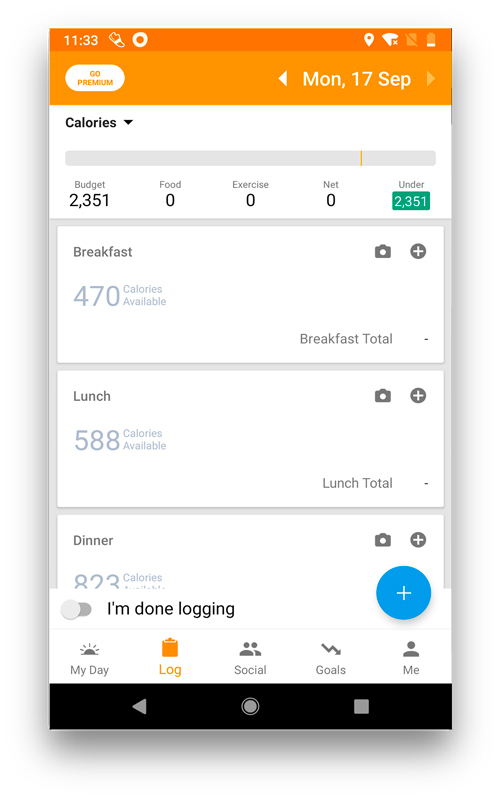 The log is stored in the phone and it keeps calories and shows the consumed and remaining calories of the day. Breakfast, lunch, dinner, and snacks are divided into parts and you can consume a set amount say 470 calories for breakfast. This helps you in consuming a set amount of calories in a set period of time. 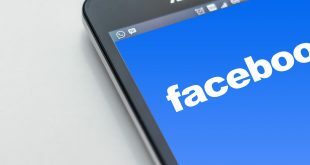 You can connect your social media with the app and stay updated on the activities of your friends, and groups. You can send messages and challenge each other for different goals. 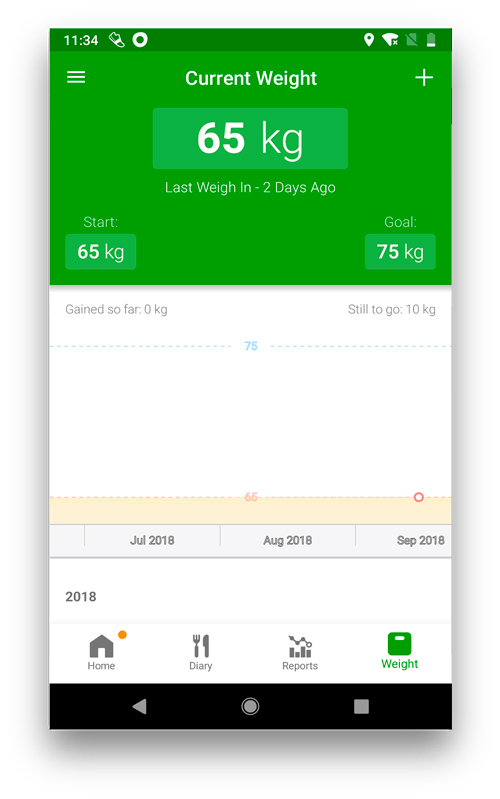 The goals tab shows the weight tracking graph which is updated everytime you enter your weight in the app. The record weight button enters the value of the log file and displays on the graph. It also shows weight loss and days left for the goal to complete. As you complete challenges you earn badges which serve as a reward for completing tasks like exercising. 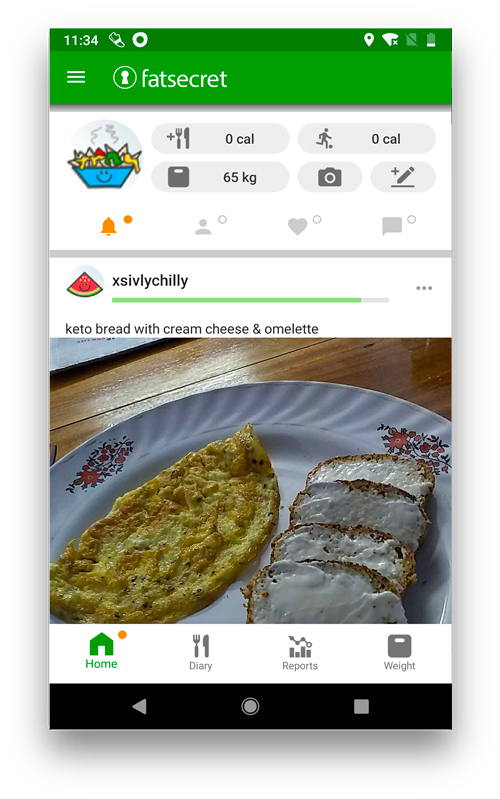 You can also keep track of what you eat and how much calories are there in a snack, this actually works well because the entries are made by people so you get a lot of different food items that are generally not part of the packed foods. The premium version is actually a subscription-based service which you can buy for around $6/month and you would get crabs tracking, and pattern recognition in your habits for effective weight tracking. It would also give you food insights and all macros about food and nutrients. Fat Secret is an intelligent weight tracker app which would give you insights about your weight and dietary habits. You have to log in to the app to use the service. Once you’re done you can maintain a diary which logs your daily caloric intakes. The homepage is a social media style timeline which shows what other people are eating on their diet. You can like and comment and share your own progress with friends. It has diet goals, an exercise goal, and weight goals. The diary tab of the app maintains your food sections and you can log your breakfast, lunch and dinner details. It shows you a nutritional chart which shows all the mandatory nutrients available in the food and how much you should consume. Exporting this data is easy and you can just tap the export button to generate a detailed report. Reports section has calories, macros, and nutrients which show a graph of carbs, fats, and proteins consumed over a week. It also compares your total amount with the goal for easy comparison. Weight tracker is simple you set a weight goal and log your weight every day in the morning and the values are neatly placed on the graph. The recipes are diverse and you can use those to include it in your diet. You can also update photos of your food and log it in the app. The app also tries to identify the image so that you can easily add it to the food diary. Mi fit is more of a health tracker but it has a few very intuitive features that make it in this list. You get two goal setting features, Activity, and weight. If you don’t already know, Mi fit also compatible with the Mi band which is a smart activity tracking device. This makes the whole manually entering the data for steps and exercise obsolete. This app does it automatically when paired with the app. You can workout while wearing the mi band like outdoor running, treadmill, outdoor cycling and walking. Everything is automatically fed into the app to generate insights about your health and body. You can turn activity alerts, wakeup notifications off and on on this app. If the app doesn’t recognize your sport or exercise you can tag the activity while performing on your app and it would recognize the next time you do it. With the smart device around your wrist, you can also improve your sleep with the sleep quality analysis feature. 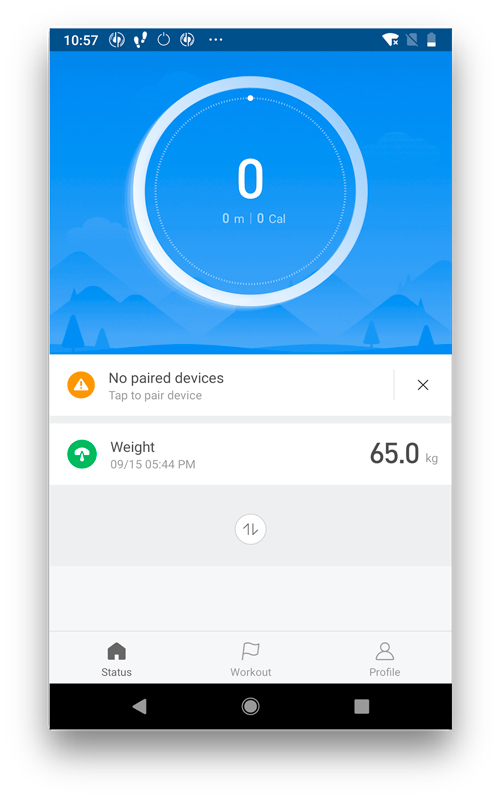 The weight tracking also gets a smart update while you can always manually enter your daily weight measurement, using a smart scale would allow you to automatically update the weight everytime you step on the smart scale in your bathroom. The progress is displayed on a graph and a shows your progress over time. 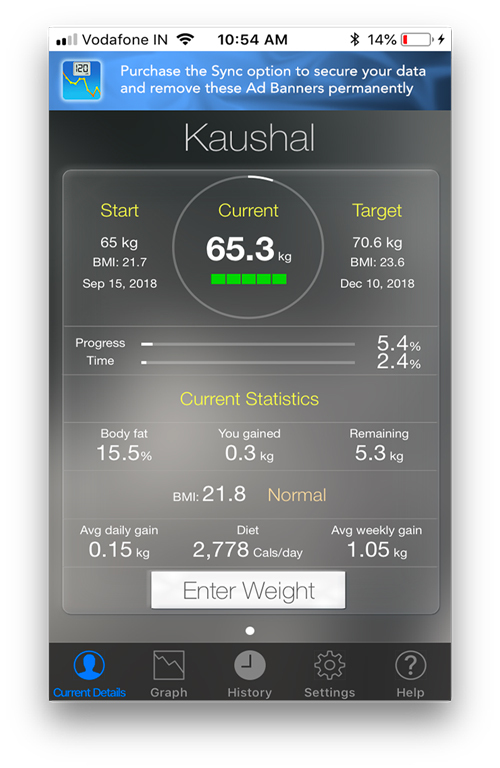 It is a weight tracking app for ios which records weight and maintains a profile for multiple users lets say in a family. You can add users when you first open the app. It asks your name age, gender, height. You can also set a photo for easy identification. You can pair your app with a smart scale. It is a digital weighing scale which measures weight and a few additional features. 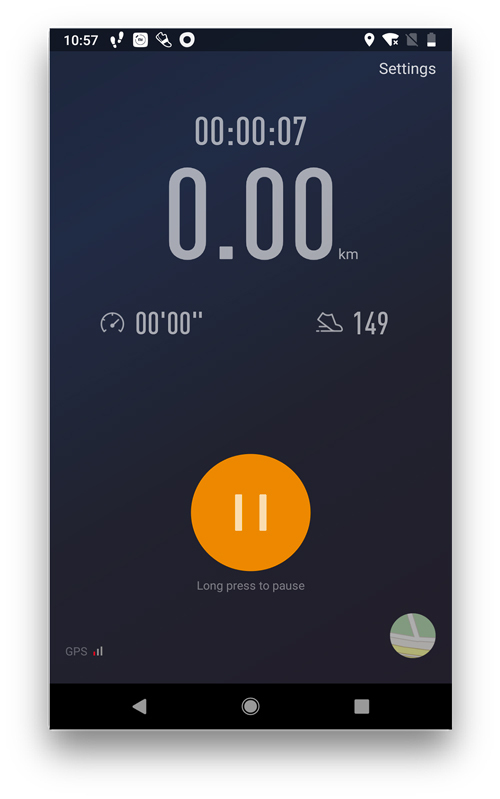 It is generally Bluetooth enabled and you can connect it with this app and enter your weight and check your progress daily. It keeps tracks of BMI fat, calorie water, muslce% etc. The info page has all the info about the BMI index, Fat % for different size group, calorie consumption and water %. 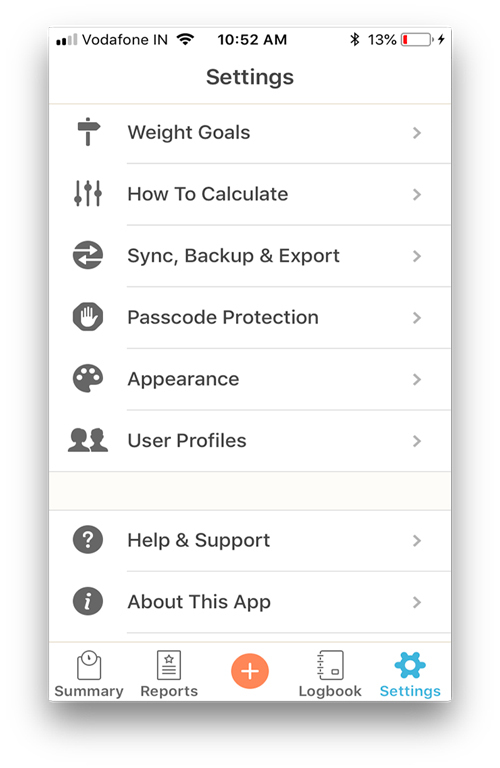 You can set this app to remind you to take your weight and input your vitals into the app. You can set daily, weekly and monthly timers in this app. I didn’t want to lose weight instead, I would like to add some meat to my bones. 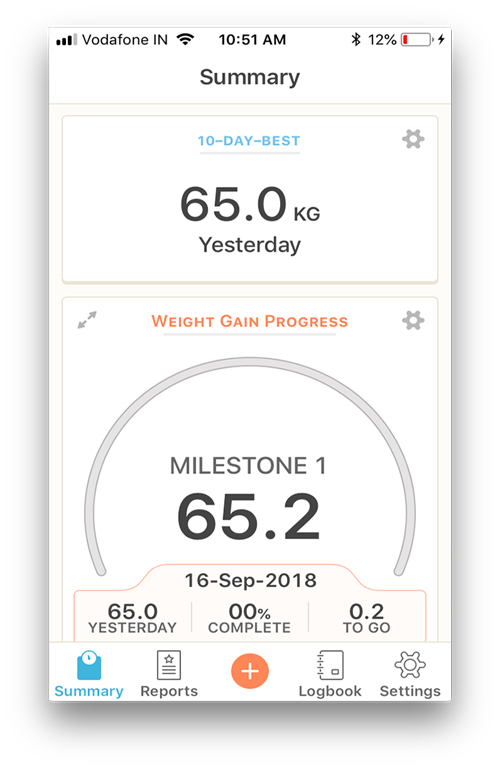 Using Happy Scale for daily weigh tracking lets you easily monitor the progress with its sleek UI. You can set a weight goal to achieve and break it into fragments so that you can easily achieve that. Let’s say I want to gain 10 pounds over a course of a month. I can break the month into 30 milestones and gain 0.3 pounds a day by increasing my caloric intake. It really makes it easier when you see every milestone achieved on the summary page. 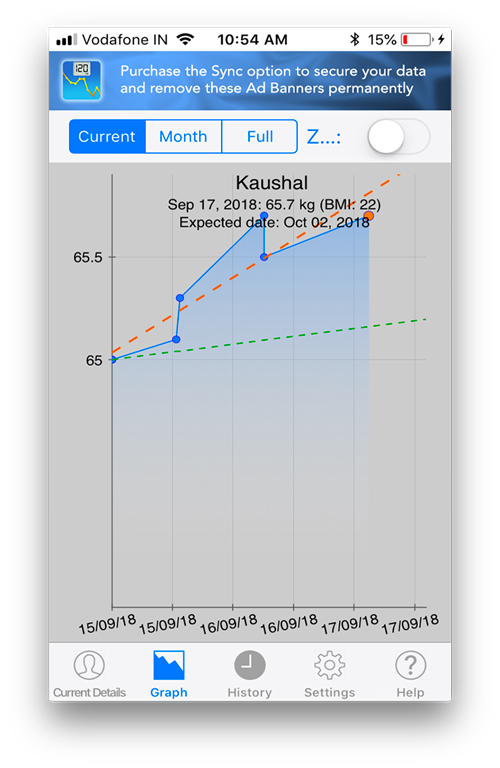 You also get weight trends which shows how much you gained in the past 7 days, 30 days and all time. With its smart prediction system and your performance, you can see your progress in the predictions tab. The report shows a weekly, monthly, and a yearly graph plotted with your weight numbers show a clear pattern of how your weight fluctuates. I weight always shoots up during the holidays. The logbook keeps a log of every entry you make to the app. You can do that by tapping the + button and enter the weight manually every day or you can add simultaneously for multiple days. Easy backup is also available and you can also sync between devices with Dropbox. The best Best Weight Tracker App? 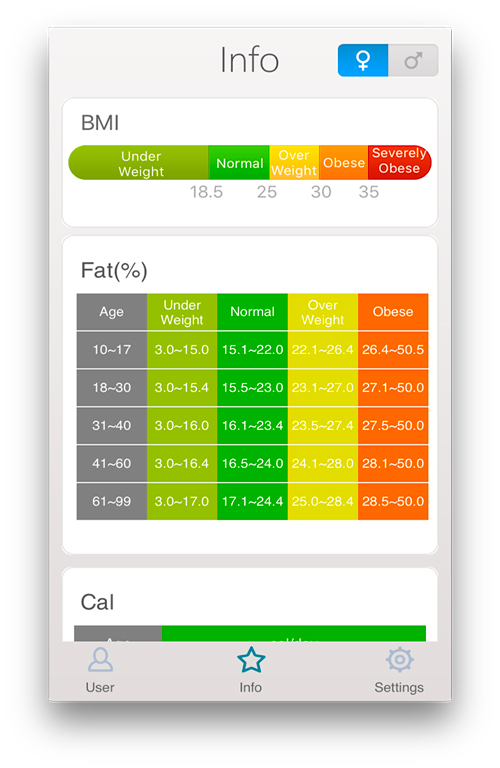 Monitor My Weight and Loseit are good for people looking for a comprehensive app which gives you detailed insights. Smart Scale and Happy scale have an inbuilt support for smart scales which automates the weight entry process. Mi fit is an all-around fitness app which takes care of all your physical activities. AktiBMI monitors your weight and BMI. Tell us which app works for you in the comments. 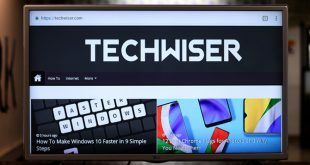 Previous 5 Best All In One Messenger App Compared – Which One To Use?